In today’s world, the fires of change confront leaders on a daily basis. Knowing how to respond to change can be difficult, but some of the best-kept secrets for effectively leading through change can be found right outside the door…in the forest. The most significant agent of change in the forests of Banff National Park is fire. Like leaders or organizations confronted by changes and disturbances, fire demands and motivates a response from trees. The response varies according to the type of tree, intensity of the fire and condition of the forest as a whole – just as a leader’s response to change varies according to personality, intensity of the challenge and condition of their wider community. This is an experiential outdoor learning activity, designed with a balance of enjoyment and learning in mind. We will explore the landscape first hand and use a combination of narrative questioning and discussion to build a connection between ecological and historical processes and the personal and organizational leadership challenges individuals in the group are working with. 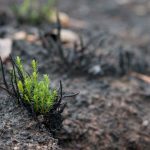 Using the metaphor of fire as an agent of change, participants will be encouraged to explore how they and the organization they work with respond to change, and how this might be similar to how trees and forests respond to change. For further details on this session, read the article below, written after the Canadian Society of Club Managers included this session in their national conference.